GIFTS IN MIND FINGER/FOOT/HAND PRINT JEWELLERY REVIEW! I am a real fan of new and innovative things in every area of my life, I love gadgets and good ideas and also small companies who are really passionate about what they do. 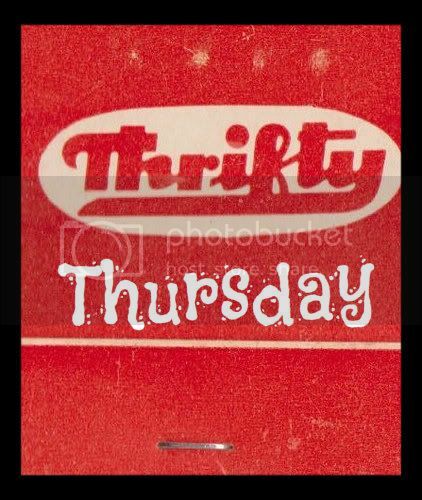 That is why when I stumbled across this website (well actually through their ebay shop) Gifts In Mind I became instantly excited. Here is some more information about them: "Gifts in Mind's range of hand, foot and fingerprint Jewellery is hand crafted at our studio in Nottingham. We take pride in producing the finest quality jewellery at an affordable price whilst paying close attention to detail and customer satisfaction. Our fingerprint necklaces and fingerprint cufflinks are second to none and will become a special treasure that will last a lifetime. 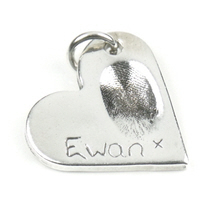 We believe that their is no finer quality fingerprint jewellery on the internet"
I love the idea of a keepsake of something that you can never get back, the beautiful hand/foot or finger print of a small baby to keep forever. My eye was instantly drawn to the lovely charms and pendants on the website, these were the ones that stood out for me. The way it works is that Gifts in Mind send you a kit with everything you need and then within 14 days of returning the prints the jewellery is sent to you. Anyway, I was lucky enough to be sent some kits and jewellery to test and review! First of all I was sent the fingerprint charm kit as this is the most popular item on the website. Everything I needed was inside an envelope - the two moulds to capture the fingerprint, a little bag to place the mould in, and a padded prepaid envelope to send everything back in - perfect! It might look daunting but the whole thing was so easy, made easier by the very straightforward instructions. Basically you join the two different coloured putty together, make a ball, then place your child's finger firmly on the mould. These are the two different bits of moulding clay that you simply roll together in a ball. Completed! I rolled the two moulds together. Son 2's finger placed on the mould. You have to let the mould set for about 10 minutes before placing it in the envelope. One padded envelope for the mould, the other for the hand and foot prints. I was also lucky enough to be sent a kit for making a hand and foot print, the hand from Son 1 and the foot from Son 2. This was even easier than making the finger print! How it works is that included in the pack is an inkless substance that is actually invisible on the skin but makes an impression on the special paper in the pack. you simply wipe it onto your child's hand or foot, it is a bit like a wet wipe then place their print on the pape. I had a few practice goes before and had to be quite "firm" with putting my children's prints on the paper but actually had no mishaps! You do need to be careful as the substance gets on your hand and it is easy to get this on the paper without realising it. I assume that Gifts in Mind would work around that though if there was a problem. Foot at the ready with inkless substance on! Invisible to you or I. Easily made foot print on paper included as part of the kit. Son 1's hand, excuse changing mat in background! Inkless substance on hand ready to print! One hand print! Note slight smudges of ink around the hand, did not affect the charm that arrived. All I had to do then was simply place everything in the prepaid envelope and send it off! Less than 14 days later here are the results! 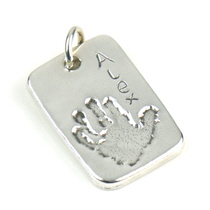 Finger print charm, beautifully presented. I couldn't get a good picture for some reason in the box but this clearly shows the hand print on a necklace. Hand and foor print on a necklace, the names of my children are to the left of the prints. Slightly better picture showing the relative size and prints. I placed the finger print charm on an existing charm bracelet of mine. I am over the moon with my necklace and charm. As you can see above I placed the charm on a bracelet of mine and have had so many questions and compliments about it! People keep asking me where I got it from and seem genuinely intrigued about it. The necklace I also love and have worn every day since it arrived. I keep seeing people glancing at it and have had lots of comments from strangers etc asking how I did it, where it is from etc. I have to say that the quality of the jewellery is excellent and in my opinion is excellent value for money. I have done some quick research on other similar companies on the internet and some of them are charging twice as much for the same product. I would thoroughly recommend this jewellery either for yourself or as a present (for Christmas?) for Grandma/Auntie etc. I think the charms would work well with a Links of London bracelet or similar. Although Gifts in Mind do their own bracelet for £38 which I think is really good value for money. Especially for BargainMummies Gifts in Mind have kindly given a 10% discount on all their products using code bmumsb10. This is awesome post. 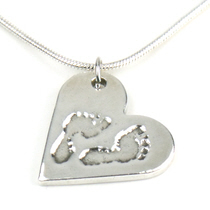 It's give a batter review to making a various kind of finger print jewellery. That showing amazing looks of pendants. I want to buy him finer print pendants in short time. So lovely and very pretty necklace.